CUP ACTION: Leeds United's Casper Sloth takes on Sunderland's former Leeds loanee Connor Wickham during Sunday's FA Cup third round tie. Three straight defeats and six without a win is hardly a great way to start a New Year, but Leeds United boss Neil Redfearn saw some encouragement in the first game of 2015. Although the Whites’ FA Cup adventure turned out to be all too brief as they suffered a 1-0 defeat in the third round at Sunderland there was enough spirit shown in the players’ display for Redfearn to see some light at the end of the tunnel in this difficult period for his side. Leeds trailed to a first half Patrick van Aanholt strike, but worried their Premiership hosts in the second period and were inches away from forcing a replay when Liam Cooper hit the woodwork with a header in added time. “I thought it was an outstanding performance, particularly in the second half,” said Redfearn. “I thought we made it a cup tie in the second half, we really got about Sunderland and we competed. “We passed the ball well throughout, but we carried much more of a threat in the second half. “We got in front of their goal a lot, hit the post, Adryan had a great chance and really we should probably be looking at progressing through the tie and having at least a replay. With seven changes to the United side that lost to Derby last week, a number of fringe players took the chance to press their claims to stay in the starting line-up, with two – forward Brian Montenegro and centre-back Dario Del Fabro – handed their first starts in Leeds shirts. Redfearn admitted he had been given food for thought with his selection for the next game. He said: “The boys that have been out on the fringes of the squad have come in and performed. They’ve really staked a claim and we’ve got to look at everything. “We’ve been right with them. We’ve kept them involved all the way with regards to dialogue and training, so now they’ve had an opportunity and what they’ve done is give us something to think about. 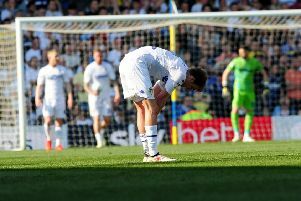 “That fighting spirit is indicative of Leeds United and what we’re about. The supporters have got to see that and I thought, second half, that was the case and we gave that performance. It is back to the Championship and another away test for Leeds this Saturday when they travel to play Bolton Wanderers. With only one win on their travels all season the Whites are not exactly going across the Pennines full of confidence, but they can make it a double against Wanderers, having beaten them 1-0 in Neil Redfearn’s first game in charge as caretaker back in August. There will be plenty of interest in Redfearn’s selection and he knows he has to get it right with points desperately needed. He also has to find a solution to a sudden lack of goals for his side, who have now gone almost nine hours since they last scored from open play.